0 to 60 mph: 3.0–3.35 sec. 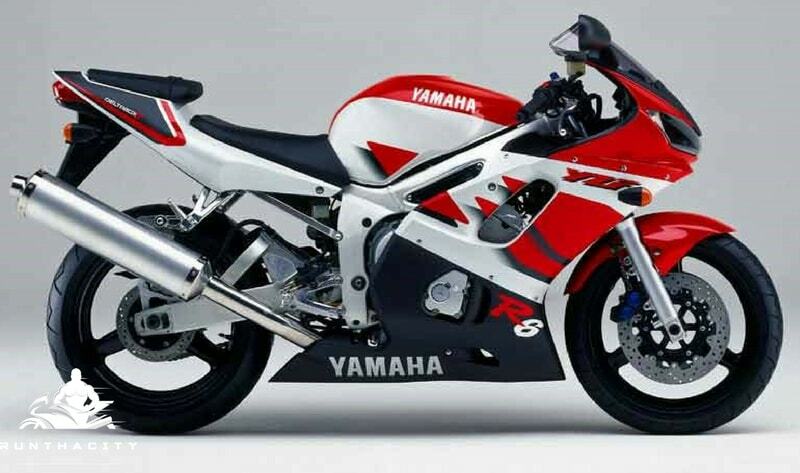 Ultra-sleek, R1-like tailsection reduces drag co-efficient for improved aerodynamics and greater top speed. Exclusive LED taillights are used improving overall appearance. Seldom need replacing. License plate and rear turn signal bracket provides easy removal (for competition use only). Lightweight forged pistons feature carburized connecting rods for superb strength and reduced reciprocating mass. Carburetor and engine settings deliver greater power output from idle all the way up to redline. Lightweight, aluminum clip-on bars provide improved comfort and superior handling. Weight-reducing refinements have shed approximately 5 pounds off this already superlight package. 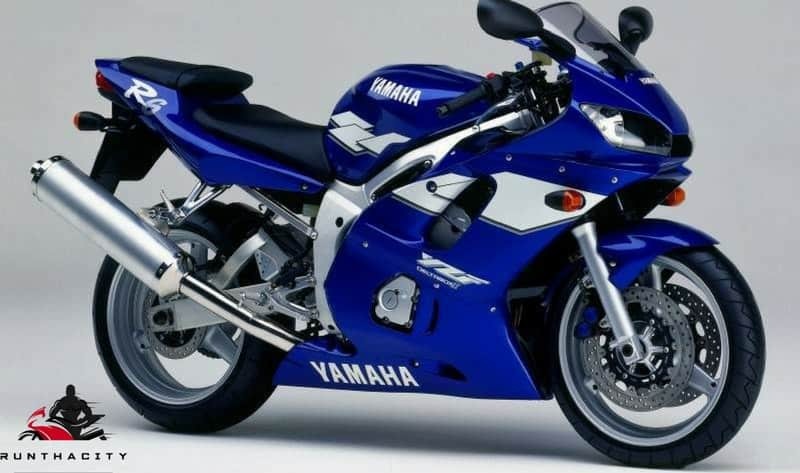 Ultra-compact, lightweight, 599cc, DOHC, 16-valve, liquid-cooled in-line four-cylinder engine puts out 120 horsepower, which translates to an incredible 200 horsepower per liter! Specially designed, one-piece cylinder and crankcase assembly provides superior engine rigidity and light weight. Engine is a fully stressed chassis member to allow for a super-light frame design. Four 37mm Keihin CV downdraft carburetors ensure instant throttle response all the way up to redline. TPS monitors throttle position and adjusts ignition timing to ensure maximum muscle across the entire powerband. Patented electroplated cylinder bores mean greater heat dissipation for consistent power delivery and reduced frictional power loss. Close-ratio 6-speed transmission delivers seamless power and maximum acceleration. Special 3-axis gearbox design stacks input/output shafts to keep overall engine size to super-compact dimensions. Compact, large-capacity, 750cc-spec clutch ensures consistent, fade-free performance. Ram Air Induction System delivers cool, high-pressure air for optimal combustion and greater horsepower at high speed. Hollow side-driven camshafts with specially designed valve lifters and computer-perfected timing helps create narrow engine width. Large-capacity 750cc-spec internal water pump and separate liquid-cooled oil cooler ensures optimal engine cooling efficiency. 4-into-2-into-1 aluminum muffler optimizes engine performance, reduces overall weight and is tucked in high for maximum lean angle. CDI ignition system features an integrated “stick-type” coil and spark plug cap delivers hard-hitting punch across the entire rev range. Deltabox II aluminum chassis features a class-shortest 54.4″ wheelbase and 56° maximum lean angle for a super-low center of gravity and TZ250-like handling. Extra-long (574mm), truss-type swingarm features forward-mounted pivot point to provide superb handling. Fully adjustable (preload, compression and rebound damping) 43mm telescopic front fork with 5.2″ of travel offers race-bred suspension performance with ultra-precise rider feedback. Fully adjustable (preload, compression and rebound damping) 40mm piggyback rear shock with 5.1″ of travel delivers exceptional rear wheel tracking and stability. Dual 298mm front disc brakes with one-piece 4-piston calipers and 220mm rear disc brake with dual-piston caliper provide outstanding stopping power. 5-way adjustable front brake lever. Lightweight, cast alloy, 3-spoke 17″ wheels front and back reduce unsprung weight for superior suspension performance. 120/60-ZR17 front and 180/55-ZR17 rear Dunlop D207 radials deliver race-spec grip. Race-inspired fairing, streamlined mirrors and sleek body cowling with Ram Air duct between headlights creates optimal aerodynamics for greater top speed. Multi-function digital and analog instrumentation with LED illumination features: digital speedometer, analog tachometer, dual tripmeters with odometer, upward-counting fuel reserve meter, water temp gauge and lights for neutral, high beam, low fuel and turn signals. Dual 60/55-watt multi-reflector headlight features a sleek, cat-eye profile for superb aerodynamics and visibility. Anti-theft wiring harness provides easy-access for hassle-free alarm installation.